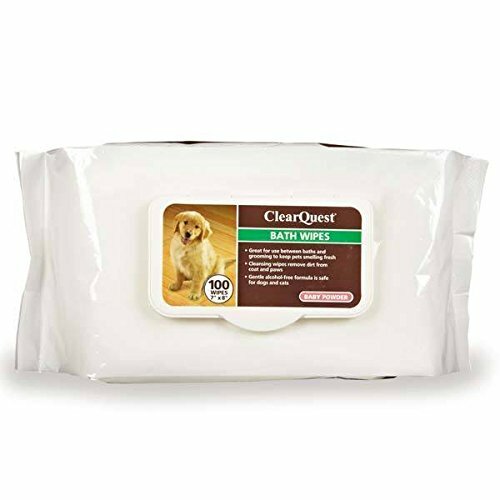 Pet Bathing Wipes 100 Ct PacksBath Wipes keep pets smelling fresh and clean between baths. These wipes contain an alcohol-free formula that is safe for dogs and cats. These wipes are alcohol free 100-count pack in the Fresh Pet and Baby Powder scentsIngredients: Propylene glycol, potassium sorbate, lanoline, kazon, vantocil TG, EDTA-2Na, purified water, sodium hydroxide, glycine betaine, fragrance. Pull wipe through package opening. Wipe pet from head to tail with bath wipes. If needed carefully wipe ears and face. Reseal the package after opening to prevent wipes from drying out. If you have any questions about this product by ClearQuest, contact us by completing and submitting the form below. If you are looking for a specif part number, please include it with your message.